This a very simple, very tasty and very Mexican way of preparing such a popular cut as the steak. When someone walks along the zocalo or through the Mexican streets, there are times in which one comes across with stalls where the beef and onion aroma can be perceived. It is in these stalls, where the steak with onions is prepared over a grill. This steak with onions recipe is magical because the flavor of the steaks and the flavor of the onion mix in the frying pan while they are fried and they create a new, different and spectacular flavor. With the steak with onions a magnificent and very complete dish can be made; for your family or for an event. Prepare the plates with mixed salad or nopal cactus salad , white rice with fried plantains and as protagonist the steak with onions. Everybody will love it! Another simpler way of serving the dish is with guacamole and refried beans – oh and a Mexican drink also has to be on the table. This recipe is a lot of fun to make because on one side you will work with the onion, on another side you will work with the steaks and at the end the steaks are pilled up over the onions. We recommend buying thick steaks so they will be juicier as in this recipe it is seek to mix the beef’s juice with the one of the onion. Preferably use olive oil because it will give a better flavor to the dish. The recipe is for 4 persons. Cut 2 onions into rings, then reserve. Sprinkle over the both sides of 1.1 lbs of beef steaks pepper to taste and 3/4 of a tablespoon of salt; then set aside. If you want and you like garlic’s taste, sprinkle some garlic powder over each one of the steaks. The rings of the Onions that were cut. Mix the frying pan ingredients and fry the onion rings for about 5 minutes, until they are moderately fried; stir regularly. Then set aside. Heat in another frying pan over medium-high heat 1 tablespoon of olive oil. Put in the frying pan the steaks with the ones you worked (just the ones that fit in) and fry them for about 2 minutes per each side, until they are well cooked or to the level of doneness that you like the most. Transfer from the frying pan to the other frying pan (where the onions are) the steaks that were cooked and place them over the fried onion rings; then set aside. The steaks are placed over the onion rings so the flavors mix. Repeat the same procedure with the steaks that were not fried, it will be necessary to add in the frying pan more olive oil. Serve the steaks and put over them some of the fried onion rings. Recommendation: Accompany your steaks with some spicy and delicious fought chilies. The best combination! 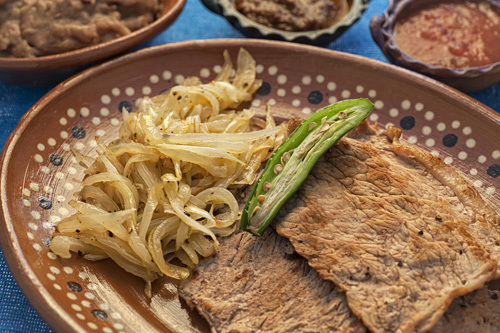 Variation: If you liked the steak with onions you also have to try the famous arrachera , a beef cut that is tender and full of flavor. Did you like the Steaks? The “Omaha Steaks" are of very high quality. They always have the best cuts, the juiciest and the best taste – ideal for this recipe. If you don’t have onions you can buy these ones. They have a strong taste and the best is that they will get fresh and intact to your door. Following the strong onion flavor, delight yourself with the “Mexican Chocolate Carlos V".